This time, the guests of the Space of Culture awaited the announced performance with great curiosity. Many did not had an idea about what they would expect in a concert with brass instruments. 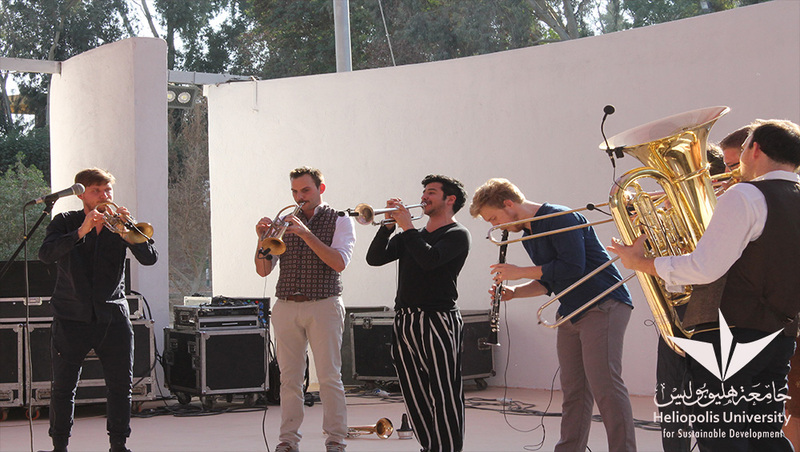 But, once the Austrian band “Federspiel” entered the stage, the audience had been absolutely thrilled by the vivid and multifaceted brass music. Federspiel hitting the stage at the Space of Culture. Already some hours before the show started, the band was getting prepared on the stage of the Roman Theater. 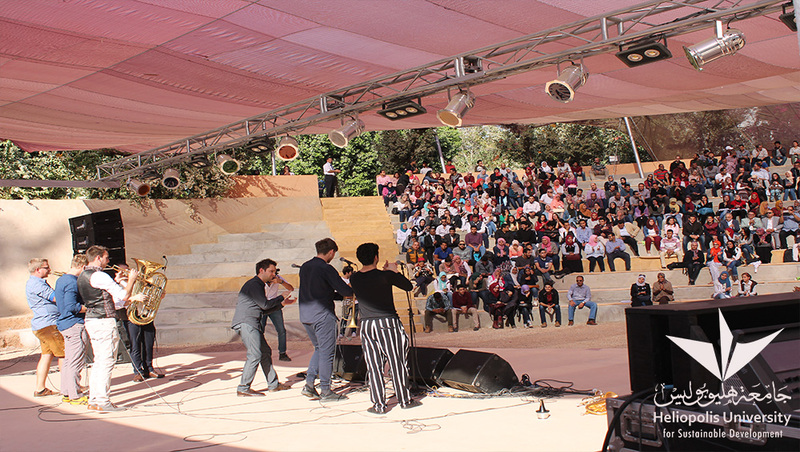 Their cheerful tunes spread over the campus of Heliopolis University and attracted many students around the theater. They got more and more excited to attend the concert. Light, spontaneous and sprightly tunes by Federspiel. At show time, the golden rays of the Egyptian autumn sun were occupying the stage and made the already shining Brass instruments glow even brighter. 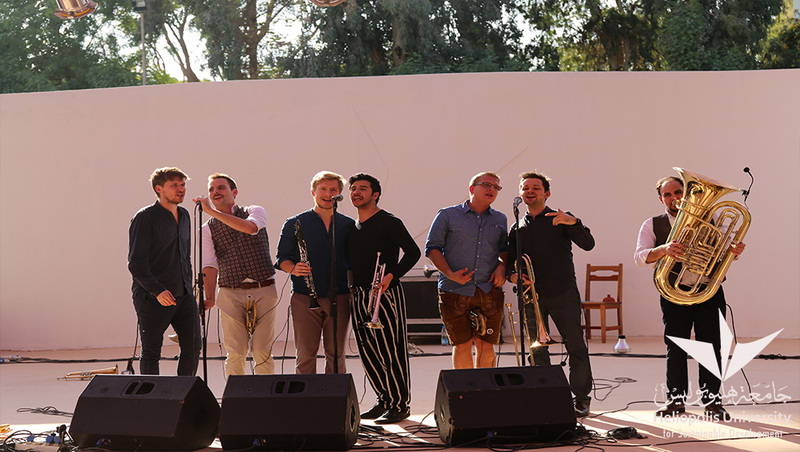 The band announced that their concert at the Space of Culture is their premiere in Egypt, sponsored among others by the Austrian Cultural Forum in Cairo. The joyful music, was quickly conveyed to the audience – with cheerful clapping and great enthusiasm they enjoyed the performance. The band presented various songs, such as folkloric Austrian rhythms, but also East European and even Latin American styles. Federspiel was formed in 2005, when seven young musicians, all students of the University of Music and Performing Arts in Vienna, had joined together. Passionately, the talented musicians combine classic with folk music and improvisation, which makes it difficult to classify them under a specific music genre. But their German name “Federspiel”, which means “Feather-Game”, indicates their unique kind of music: light, spontaneous and sprightly tunes, as a feather that flutters through the air.